Regardless of the type of event you’re hosting, a hashtag can be useful for compiling photos and interacting with guests before, during and after an event! For corporate events, an event hashtag not only allows the attendants to look back on the event, but it creates online visibility and is a lucrative way to engage guests. Event hashtags, when used properly, create a digital presence and attraction to your brand or company. For weddings, using a specified hashtag means guests can see photos of themselves that might’ve gone untagged or missed without the event hashtag. Most importantly, this allows the bride and groom to look back on the event and relive all the fun memories from one of the best days of their lives. Here are a few ideas on how you can get started on creating a unique one for your event! 1. Keep it short. Simplicity is key. Your hashtag should be as short as possible and take up as few characters as possible. If your guests will be posting on Twitter, the last thing you want to do is take up too many of their limited 140 characters! Abbreviate event names that are long. For example, Austin music festival Blues on the Green uses the hashtag #botg, as opposed to #BluesOnTheGreen, which is pretty long. Keeping it simple also means fewer people will forget exactly what your hashtag is. If they can’t remember, they won’t use it. 2. Use the event's name and location. If the convention name is BeautyCon, using #beautyconLA may be more effective than simply #beautycon. 3. Include the year for annual events. If creating a post for an event that occurs annually, including the year to specify which year is attended - for example, using #beautycon2017 or #beautycon17. 4. Make sure to determine a good event hashtag well in advance. Once it has been created, start using it yourself as an organizer and notify your audience about it. For example, runners who are training for the Austin Marathon in 2018 can use the hashtag #austinmarathon2018 when posting a photo of them training in the months leading up to the race. There is great power in promoting a hashtag before an event, especially if the goal is to encourage participation from the public. For annual events, having a consistent hashtag every year also allows the participants to refer back to previous years’ photos by simply changing the year at the end of the hashtag. Wedding hashtags have recently become increasingly popular, so it is important for your hashtag to be unique. After all, you don’t want to see photos from a random wedding that isn’t yours showing up under your wedding hashtag feed! Here are a few tips on creating a hashtag that is personal and specific to your big day. 1. Make the hashtag easy for guests to remember. Wedding hashtags that have a play on words may be easier for guests to remember. Consider mashing your names together or focusing on the last name if you plan on sharing a surname after you’re married. Puns are always welcomed (and totally encouraged, if you ask us!). For example, one of our recent wedding clients’ new last name is Newberry, and their hashtag was #TheNewestBerry! We even saw a wedding where the the groom’s surname is Morgan, so they chose the hashtag #ILoveYouMorganAnything. Get punny, because the funny hashtags are typically the most memorable! 2. Avoid any hashtags that could be potentially misspelled by your guests. Try shortening any long names or move words around to avoid having two of the same letters next to each other. For example #davidandashley looks much better than #ashleyanddavid. 3. Use a hashtag generator. If you're having trouble coming up with an original hashtag, try checking out a hashtag generator to get started. Sometimes it’ll get your creative juices flowing and help you come up with something unique. 4. Get the word out about your hashtag. If a hashtag for the wedding has been created before the couple walks down the aisle, use it on photos of the couple engaged. If you are the one walking down the aisle, consider using it when snapping a photo of you dress shopping or wedding planning. Put it on your save-the-date and your wedding website and get the word out! We hope these tips help you create the perfect hashtag for your event. What's your favorite hashtag you've seen so far? January has already flown by, and we kicked off 2017 with an open house at one of our favorite Austin venues: Mercury Hall! 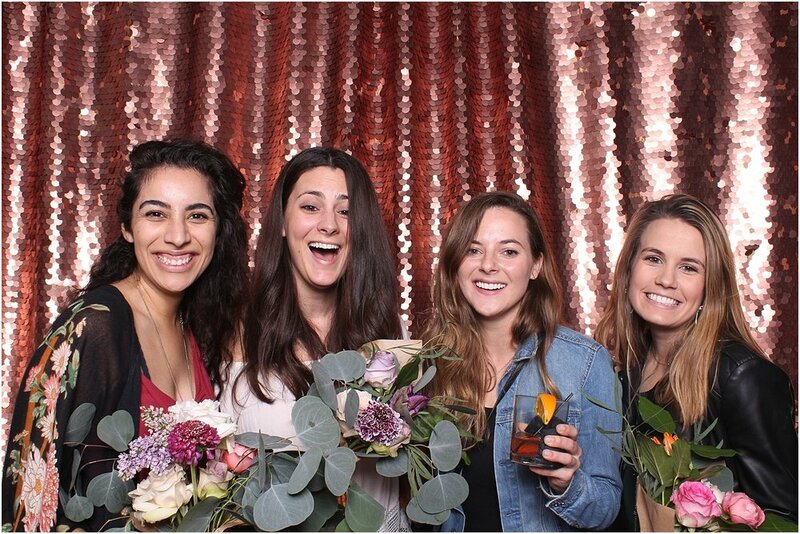 We had a blast meeting the future brides-to-be and guests. Luckily for us, we had the best of both worlds by being under the clear tent, which was strung with festoon lights, and being able to peek into the chapel and its stunning stained glass windows! Even though it is minutes from downtown, the greenery that surrounds Mercury Hall makes it feel secluded from the busy streets of Austin. The Loot Vintage lounge was placed in the middle of the canopy, and we were drooling over their blue velvet bench in particular! It’s never really hard work when we get to work alongside other amazing vendors such as Gypsy Floral, who was there to create beautiful bouquet arrangements for each guest, Feathers and Frosting, who offered delicious cake tastings, and the beautiful custom designs of Parcel Design Co. (Fun fact, the owner of Parcel Design Co was actually the room mate of our owner, Kelsey!) Vanilla Orchid catered some of the most delicious bites for the event as well. We really could not have asked for a better Thursday night! We love open houses because it gives us a chance to meet and chat with guests on a more personal level and get a better feel of what they are wanting at their special event. Big thank you to Mercury Hall for hosting such a wonderful night, we cannot wait to meet YOU at the next one!